Retainers after braces, orthodontic treatment options and long term retention provided by Dr. Halberstadt. Retention (wearing retainers after braces) is your next phase of treatment after your braces have been moved. We view this as a VERY important phase. We have several types of retainers available for you and we've realized over the years that no one retainer is ideal for all of our patients. 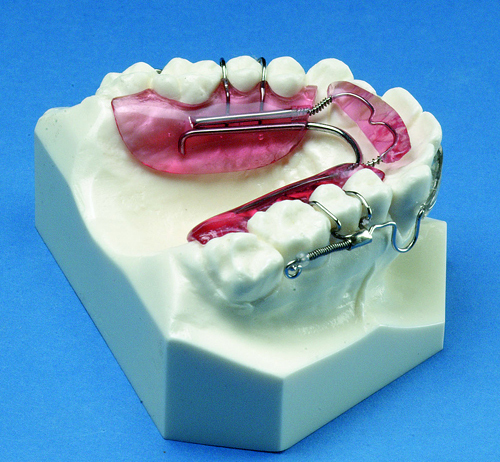 Most retainers are removable and some are used just for sleeping. Others might need to be used all of the time. Several types of retainers will be reviewed to help you visualize how they work, and Dr. Halberstadt will assist you in selecting the right one for your needs when you are approaching the end of your active phase of your treatment. The Inman Aligner is a simple removable appliance used to align front teeth quickly and safely. It's ideal as a stand alone treatment or to pre-align teeth prior to further cosmetic options such as bonding or minimal veneers. Most cases are completed within 6-18 weeks. Your Inman Aligner dentist will give you a realistic guide of what to expect. For suitable cases, the Inman Aligner is usually much faster than alternative orthodontic techniques. The Inman Aligner has Nickel Titanium coil springs that power two aligner bows that gently oppose each other, guiding the teeth into their new position. These gentle forces are active over a very large range of movement, which is why the Inman Aligner works so quickly. The diagram to the right shows the squeeze effect of the two aligner bows on the front teeth. The inner bow pushes forwards, while the outer bow pulls back on the front teeth.